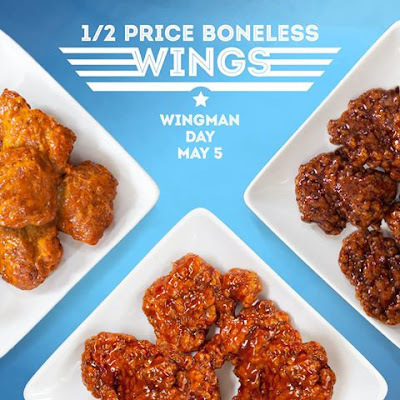 Get your wingman and head over to Sonic were today (5/5) only you can get some tasty Boneless Wings for ½ price! 6 & 12 Piece Boneless Wings only. *Tax not included. Add-ons cost extra. Cannot be combined with other offers. Offer valid 05/5/16 at participating SONIC Drive-Ins while supplies last.